Puhka Nanfa Hotel provides a quiet atmosphere which guests can fully relax while staying in the hotel. “Worship the Chang Lom, Sukhothai shape stupa, pay respect to golden walking image of Buddha” is the sentences that show the outstanding identity of Wat Phra That Chang Kam cleary. Wat Phra That Chang Kham Wora Wihan or the old name as” Wat Luang Klang Vieang” located at the opposite of the Nan National Museum (Hor Kum), aged more than 600 years, established in B.E. 1949 by Phaya Phoo Kheng, King of Nan. King of Nan use this place to perfomr the Buddhism ceremony and drink an oath of allegiance as the stone inscription number 74. 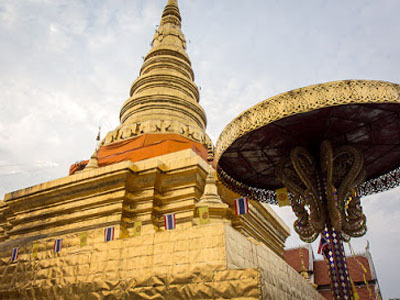 In the Wat Chang Kham has important sacred places such as Chang Kam Buddha’s relics pagoda, inside the Buddha’s relics pagoda in Lunka shape or bell shape, decorated with blink Junko golden. It is so the place of the Buddha’s relics. Around the Buddha’s relics, holding-elephant shape floating stucco orderly around the pagoda, 6 each per side, in total of 24 elephant, which may be the origin of the name Wat Phra That Chang Kam in present. Nan people will call this Phra That as “Phra That Luang” as the past. Tripitaka hall, is the biggest Tripitaka hall in Thailand, built in the period of Phra Chao Suriyapong Paridech in B.E. 2453 for keeping the Tripitaka made from dharma inscribed palm leaves. Inside has the Phra Nunthaburi Sri Sakayaminee, the golden image of Buddha, in the walking posture from the Sukhothai arts placed in the hall. 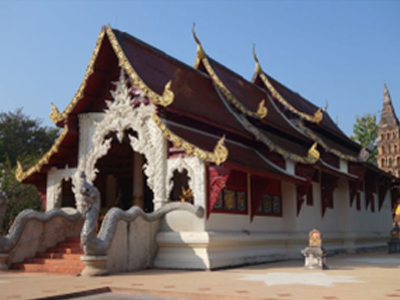 It is the ancient and respectable temple for more than 600 year, established in the old area of royal sugar palm tree farm by Phra Nang Pathummawadee on B.E. 1955, so that its name is “Wat Suantarn”. Inside the temple has a big bronze image of Buddha of the attitude of subduing Mara posture named “Phra Chao Thong Tip” that Nan people respects as the respectable image of Buddha. Phra Chao Ti Lok Racha of Chieng Mai pleased to establish on B.E. 1992 to show the victory of conquered Nan. 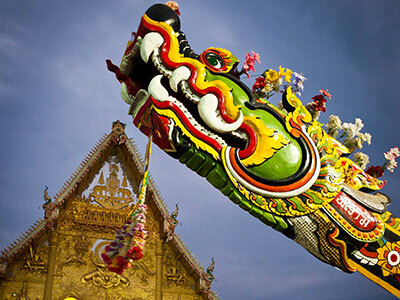 Every year in the Songkarn Festival period, Nan people, will set up the worship ceremony and pour water to Phra Chao Thong Tip. The area nearby the big temple, there is another small temple, inside of the small temple has an image of Buddha sitting with legs fold-back sideway, which is the first one found in the Northern part of Thailand and hardly seen, also an image of 5th Phra Chao placed in the same place, so that there will be a lot of people come to worship for their luck. Wat Ming Muang, is where the MuangNan’s city pillar placed. If you have arrived to Nan, you must come to pay respect for the luck and it is the wat that has an exquisite stucco temple hall, which made by the Chieng-San lineage. Inside contained mural paintings which shown the way of Nan people’s life, by the local modern artist. As before, Wat Ming Muang is deserted, aged around 149 years, after that on B.E. 2400, Chao Ananta-woraridthidech, ruler of Nan, pleased to establish this wat as “ Wat Ming Muang” as the name of the city pillar, “Soa Min Muang”, placed in the exquisite dazzlingly white stucco ,Chatulamuk Pavilion, which is located in front of the temple. The city pillar made from 3 maters height teak, the base decorated with the lacquer carved wood, the top of the pillar carved as a 4 faces Brahma, which has the name as loving-kindness, compassion, sympathetic joy, and equanimity. Wat Hua Khuang is one of the important temple of Nan province, as the contruction in this temple such as stupa, temple, pulpit and scripture hall, are all in the true Lanna arts. 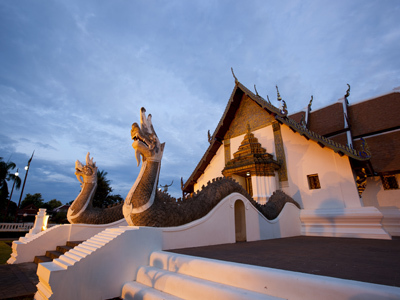 The Fine Arts Department has announced that Wat Hua Khuang is the National Historic site on 12 August B.E. 2523. It is located in the important historic area of Nan in the past. Not clear information about when it was established, but there was the evidence of the reconstructed of the temple, first time in B.E. 2454 by Chao Anunta Woraritidech, King of Nan, as the period of King Rama the 4th of Rattanakosin (Bangkok). The word “Hua Khuang” is the big wide field, so that Wat Hua Khuang is the Wat with big wide field. 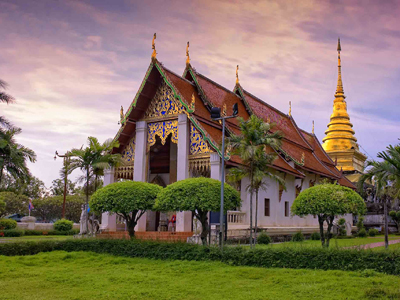 Wat Hua Kwuang has the important historic site which is the Lanna art and culture such as “Jedee Wat Hua Khuang” or Wat Hua Khuang’s Stupa, it is the palace shape, or golden house, it is being effected by the Lanna arts. The image of Buddha in the attitude of subduing Mara posture is inside. 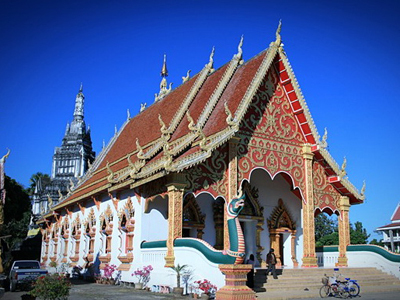 “Hor Trai” or scripture hall is a high quare building, Lanna art mixed with arts. “Thummas” or pulpit is a square pulpit, the top is craved Chinese gourd shape, lacquer and decorated with glasses. Wat Phaya Wat, as before, the area of the Wat was the central area of Nan, when moved the city from the Phra That Chae Haeng to be at the west side of the Nan river. It is the location of Charmma-Devi pagoda or Wat Phaya Wat Buddha’s relics, the one of the old, sacred and important place of Nan. It is a pagoda made from the laterite at the Her Majesty, Charmma-Devi. The artisan has brought this form form Lum-Phoon province, in the period that Lanna was peek of flourish. “Phra Chao Fon Sa-nea-har” or “Phra Chao Sai-fon”, which is an image of Buddha that Lanna people invited for the pray for rainfall ceremony, is placed inside the temple. The oldest “Wood craved pulpit” which found in Thailand, we presumed that it was built on the Authataworn-Punyo period, around the first half of 24th of Buddhist era by the Nan skillful artist.